Cycling can be an exciting activity that allows you to enjoy seeing different types of scenery while performing physical fitness in the great outdoors. Those who want to set new goals and extend the activity can take a longer ride to have a new experience that can be more challenging. Here are a few critical ways that you’ll want to prepare for a long-distance bike ride as a cyclist. Maintaining your energy levels will require you to continuously eat and drink during your bike ride. You’ll need to consume at least one bottle of water for every hour that you ride to stay hydrated and maintain mental clarity. It’s also necessary to eat one to two bites of food every 15 minutes. Pack your bags with plenty of food and water, depending on how long you plan to spend on the bike. 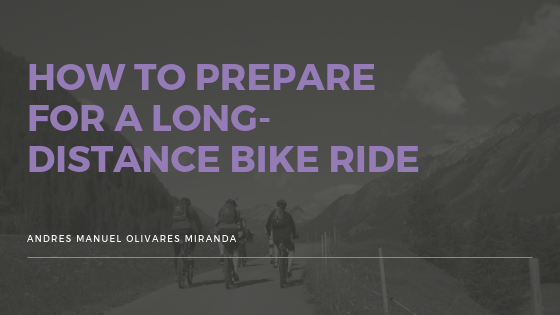 There are many situations where the unexpected occurs on your bike ride, making it necessary to prepare in advance. Plan for potential problems that can occur, which can include getting a flat tire, losing your ID, or getting lost on the route. You’ll need to pack extra tools and equipment with you to ensure that you have a solution to common problems that can potentially occur when you’re away from home. According to telegraph.co.uk, conserve your energy as much as possible to ensure that you can finish the ride. Keep a high cadence and avoid riding in a gear that may be too small, which can cause your body to work harder to keep the bike moving. Pace yourself and avoid riding too fast once you take off, which can make it more challenging to continue moving your legs and maintaining your balance once you reach the end of the course. Keep aerodynamics in mind as you ride on the bike by shrinking your body, which can allow you to go faster without as much effort involved. Practice putting your elbows inwards toward your body and try to ride on your drops. Your head and arms will also need to be tucked in to ensure that the wind doesn’t cause as much force to come against your body while you’re in motion. This article was originally published on AndresManuelOlivaresMiranda.net.